When announcing the sanction, National Security Advisor John Bolton also flashed a sheet of his notebook to journalists where “5,000 troops to Colombia” was written. This potential threat of 5,000 troops to Colombia was later denied, but it’s clear that the move was meant to instill fear and remind Venezuela and its supporters that a military option is still on the table should they not respond to US demands. The latest sanctions are possibly the toughest that have been applied on the Latin American country since the US began its campaign of sanctions under Barack Obama in 2015. The sanctions began when Obama declared Venezuela a threat to the national security of the US and have been steadily increasing in severity since then. The sanctions have not only caused millions of dollars in losses to Venezuela, but have starved and deprived the people of Venezuela by impeding the purchase of crucial products and goods like medicine and food and diminishing the available funds for social projects. The dire situation created by the sanctions is the same one that has forced thousands of Venezuelans to leave their country behind. On Saturday January 26, US Secretary of State Mike Pompeo called for an extraordinary session of the UN Security Council in attempt to convince the council to “pick a side” and stand with the United States and recognize Juan Guaidó as President of Venezuela. However, his attempts to gain support for the coup diplomatically also failed. 19 of the 35 countries rejected Mike Pompeo’s remarks and refused to join the US in recognizing Guiadó and aso rejected the efforts of the US to encourage confrontation and violence in the Latin American country. Within Venezuela, Juan Guaidó and his illegitimate parallel government has also been making efforts to chip away at the stability in the country. On Tuesday January 22, the National Assembly of Venezuela, which has been in contempt of court since 2016 and whose actions are null, “passed” the Law of Amnesty and Constitutional Guarantees which offers guarantees to police, military and civilians that collaborate with the “restitution of democracy and constitutional order in Venezuela, violated by the de facto regime lead by the person who today is usurping the Presidency of the Republic”. The law essentially calls for functionaries of the police and military to openly rebel against the democratically-elected government and ensures that they will receive amnesty. 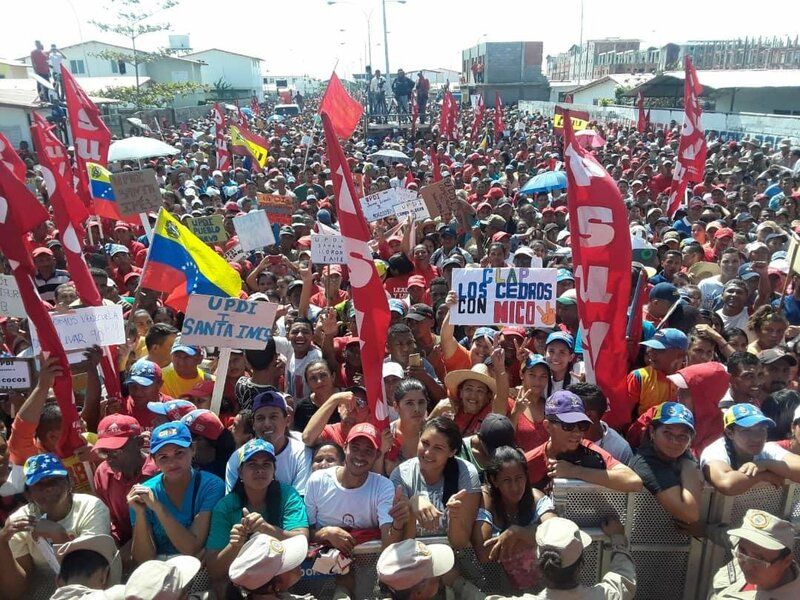 The National Bolivarian Armed Forces have been firm in their support of Nicolás Maduro and have announced their unconditional support to their democratically elected president on several occasions. On April 17, US national security advisor John Bolton announced a new set of sanctions on Cuba, Venezuela and Nicaragua.